It has been a while since the last post but the DSRA has not been idle: quite the opposite! The issue is finding the time to not only attend meetings, but also to write reports, combine them with other info we think relevant, and then get it all out to you in a legible(ish) fashion. So happy new year everyone, and on with the backlog of news (sorry)! The budget for 2015/16 is now agreed and invoices for the new financial year will be sent out by Consort over the coming days. There is an overall increase in the budget of 3.8%. The increases result from staff salary increases to bring site staff closer to the London Living Wage, and the need to increase reserves in some phases owing to redecoration costs. Some savings were achieved on individual budget items including window cleaning, door entry and plant and machinery contracts. There is an increase in the management fee for all units, from £233 to £238 in the new financial year. This is lower than the increase originally proposed by Consort, following representations by DSRA. There is very considerable variation in the Service Charge increases per unit, with most increases between 2.8% and 10%. The most significant differences are between phases, bringing the newer phases into line with the cost per square metre of phase 1. We also recently held our regular quarterly meeting with Consort to discuss all buildings and maintenance issues, and were pleased to have representatives of Barratt Homes and Hackney Council able to accept our invitations to attend. With the co-operation of the other parties the DSRA maintains 3 separate logs: One each for Consort, Barratt, and the Council. Over the past year all 3 logs have been shrinking steadily in size as line items have been addressed and removed from the active log, and this last quarter was no exception. The updated copies of the 3 logs along with a written report from DSRA Chair Ben Collins are all available for download from the ‘Document Depository’ in the ‘Residents Only’ section of our discussions forum HERE. If that link does not work for you, you need to read THIS thread. After reading that, register for forum membership HERE (a simple 2 minute process), then make an application HERE (again very straight-forward, just follow the other examples). It has been said before but I will say it again: Any/all residents are welcome to attend any meeting (although space dictates numbers at some point of course). Please just let us know beforehand so we can bring you up to speed on what has been previously discussed, to save wasting valuable meeting time on repeating previous discussions. Buildings & Maintenance meetings generally start around midday (but as early as 11.00am) midweek, and can go on for a couple of hours or more. Finance meetings tend to start at 6pm, again midweek, and can go on for an hour and a half or more. I have a few other brief items of news but will save them for a second post: These meetings are the more important updates I feel, but I do not want this post to get too long. To ensure that residents in the vicinity of Dalston Square are consulted about the cultural programming of the square. To ensure a shared sense of ownership of the square from all sections of Hackney’s community. To create an opportunity for other key stakeholders, representing cultural venues in the Dalston area, to participate in the shaping of the programme. To identify opportunities for linking Dalston Square’s programme with cultural activities taking place in other public spaces in Dalston, in order to ensure a complementary approach. To develop opportunities for Dalston Square to become a vibrant and healthy area that promotes a variety of well-being initiatives. The Forum meets every 3 months and is comprised of: Lucy McMenemy, LBH Dalston Town Centre Manager Cory Defoe, Dalston ward councillors Sophie Linden and Michelle Gregory, and finally 7 ‘local resident’ representatives. These 7 are comprised of 2 reps each from Dalston Square and Rhodes Estate, and one each from Mayfield Close & Forest Grove Estates, Forest Road, Acer Street & Holly Street Estates, and finally Keswick Lodge & Panton Lodge. The DSRA have had representatives on the the Forum right from the first meeting back in May of 2012, and I have been publishing the meeting minutes to our own discussions forum for everyone to peruse (minutes from all 8 meetings so far, including the latest one on March 12th, can be found HERE). And hopefully everyone has enjoyed at least some of the many events that have already been staged here in the Square over the last couple of years. Probably the most ambitious of these was the one day Christmas market held here last December. With the Square now all but finished, and after the success of previous events, thoughts are turning to the possibility of bigger, grander events. Though still early days, a 2014 Christmas market could be one such event: If a small one day event can be a success, how about a 3 day market with double the amount of stalls including food & drink, and a sound stage for performances by local school choirs and performers (the market would also need at least a second day to make it commercially viable)? At the bottom of this post you can see the proposal document of just such an event (click the thumbnail to see it full size). Because of it’s size though, the Culture & Community Forum are looking for opinions from the wider Dalston Square residency. The DSRA have expressed concern that any such event would need to be well planned and run (with marshaling and policing if it will truly ‘fill’ the Square). Sound stage volumes would have to be monitored to ensure they do not become a nuisance to residents overlooking the Square (as several hundred residents do), and after the failings following last year’s market, cleaning up after the event would also need to be swift and thorough (and probably necessary both during and after each day rather than just at the end). If these concerns were alleviated though, we feel such an event could really put some life in to the place, drawing in visitors (along with their wallets) from across London. Surely this could only be a good thing for the local community as a whole. By all means feel free to leave your comments here but in order to gauge opinion on this and a few other issues, the DSRA will soon be sending out a very brief (a dozen questions at most) multiple-choice questionnaire to every apartment in the development. Yes, Dalston Square is a public space, but it is also home to very nearly 600 apartments with well over 1000 residents. This is acknowledged by the council who have given us a ‘voice’ on this issue. If you have an opinion, please do share it. As I say, the questionnaires will be going out shortly, and I will be posting an electronic version here on the website for those who prefer mouse & keyboard over pen & paper. 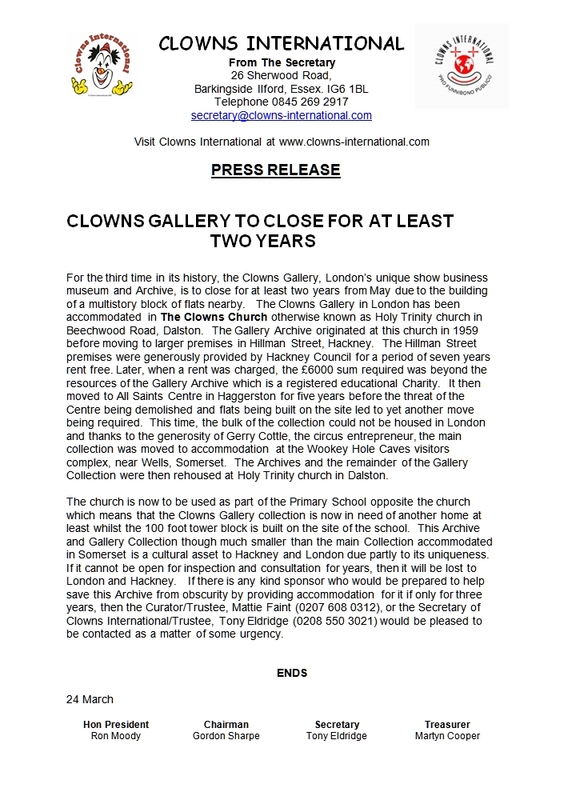 On a completely different note, the Clowns Gallery, London’s unique show business museum and archive, currently housed in Holy Trinity Church (also known as ‘The Clowns Church) in Beechwood Road, is appealing for help. the second thumbnail below is their press release with all the details, so rather than me repeating their words, please click on that thumbnail to view it full size. A couple of weeks have passed since I promised an update on the completion of the Square and apologise for not getting back to you sooner. Basically, things should be wrapped up(ish) by the end of the year. Sledge Tower is, as you will know, now complete, and Joplin House, the last block that will complete the development, should be finished by the middle of November. Once that is complete, the Barratt site huts will be moved out of the Square (with the remaining tradesmen moving into the offices behind the Barratt sales office) and the remaining public area will be finished off. The sales office will continue to be manned until January, at which point, with the completion of building works, the tradesmen will depart, as will the sales staff who will be moving on to a new Barratt development over Islington way. For those of you who know Richard in the sales office (who has been manning the office from day one of it’s opening), you will be glad to hear he is to become a resident of the Square and so will not be leaving us completely. With regard the commercial units around the Square, the biggest news is probably the imminent opening of the Smooth You Town Spa in the double unit beneath Burke and Dekker. As you will no doubt have seen, work is well underway and should be finished by the end of November(ish). 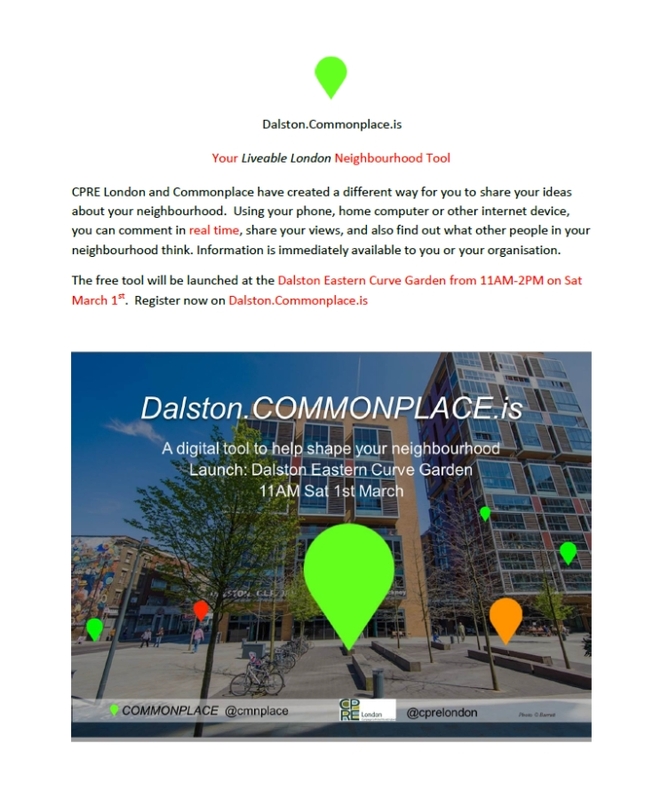 They have advised us, via our Twitter feed (@DalstonSquareRA), that as well as a general public launch party, an invitation-only party for residents is also being planned (more details as soon as I have them). The only other definite news is the recent signing (2 weeks ago) of contracts for the unit to the left of the Barratt sales office (the one with the Cafe Rica graphic in the window). No confirmation yet on who has taken it, but no doubt we will hear soon. There is also news regarding the Holy Trinity School saga. A date has now been set for the GLA (Mayor Boris Johnson’s office) public meeting: 19th November. All those that made representations to the Hackney Council hearing on this development will be contacted 14 days before the new hearing with details of how they can be involved if they wish to. You will be pleased to know that the group of concerned Square residents who campaigned so brilliantly the first time around will again be active on our behalf. While the idea of expanding the school and creating much-needed places is to everyone’s benefit, the plans as they stand were rejected for very good reasons and we can but hope that Mayor Johnson and his representatives will support Hackney Council in their original rejection of the plans as they stand. One last thing to mention, yet another new development has become public. Some residents have received a letter from Hackney Council regarding development of 514 – 600 Kingsland Road. This is the strip of retail units from, and including, the noodle bar on the corner with Dalston Lane, right down to, and including, Oxfam on the corner of Forest Road. Details are very sketchy but Square resident Kevin (forum post HERE if you have further info to share) found an online reference to it that mentioned buildings of 7, 10, 18, and 19 stories. Apparently plans are available for viewing at the Hackney Service Centre. A quick look at the DAAP (Hackney Council’s own Dalston Area Action Plan) shows that ‘opportunity sites’ on Kingsland only exist north of the Balls Pond Road/Dalston Lane junction. I will pass on more info on this and all other proposed developments in our neighbourhood as I receive them. I think that is it for now: All up to date. Have a good week all! In a sprawling city like London it is easy to forget that politics stays local through the borough councils. And after reading the recent reports regarding absenteeism in our own Hackney Council (see our recent Twitter posts @DalstonSquareRA) how reassuring it is to know that our representatives are listening to, and working for, residents here on the Square. For those not aware, Hackney is a Labour controlled Council, the Square is in Dalston Ward, and we are represented by 3 Labour Councillors: Michelle Gregory, Sophie Linden, and Angus Mulready-Jones (more info HERE if you are interested). Why am I telling you all this? As many will by now be aware, plans have finally been submitted to the council for the redevelopment of the Holy Trinity School site at the southern end of the Square. As well as a doubling of the school’s capacity, 99 apartments will also be included in the proposed 10/11 storey building that will pretty much fill the whole site. Those directly affected (residents of the south facing end of Labyrinth Tower as well as the 4, soon to be 5, blocks that overlook the site from across Roseberry Place), are understandably upset that their outlooks, and more importantly light, will be seriously impacted if this project goes ahead as planned. Because of this, many have been contacting Cllrs. Gregory and Linden directly, rather than/as well as going the official route: Using the comments page on the Hackney Council Planning Department’s webpage HERE: The deadline for comments is April 15th. Because of this the DSRA (via Ben Collins, Chair) has been contacted directly by Cllr. Gregory. On our behalf she is working to arrange a meeting, in her words “…with the school and developers to which Dalston Sq. and other residents will be invited………. to which Cllr Linden and myself will aim to attend”. Cllr Gregory will be contacting me directly when this has been organised and I will be passing on the details via this website and our forum. Cllr. Gregory will be replying to all those who have contacted her thus far, but asks that residents now cease contacting her directly as all she can do is pass comments on to planning (which is not as efficient or valuable as your comments posted directly through their website). Cllr Gregory has also recommended the website of Planning Aid For London, who provide valuable information and support on planning objections. Watch this space for further details as I receive them. Also from Hackney Council, I have again been contacted by Lucy McMenemy, Cultural Programme Officer, with an invitation to all residents to the next public event to be held here in the C.L.R. James Library, the public space of the Square, and the Eastern Curve Garden. Hackney Wow! is a new kids’ online guide to all the fun stuff they can get up to in the local area, created by pupils at Rushmore Primary School. The planned events, on Wednesday 27th March, are to publicise the launch of this new website. As part of this, Dalston Square will be taken over by Hoxton Hall’s street performers: Cool. 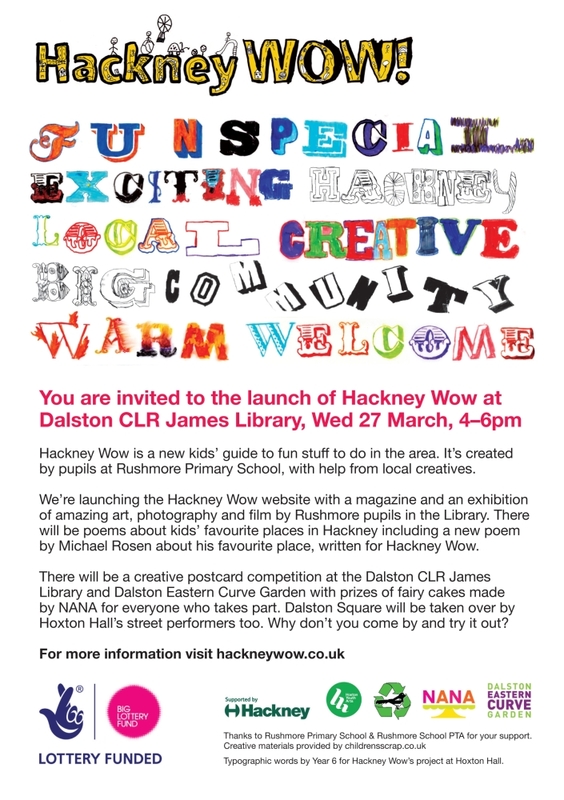 For full details of all that is planned see the flyer below (click on the thumbnail to see the full size image), and check out their website at hackneywow.co.uk. One last thing before I leave you in peace: The minutes of the latest meeting of the Dalston Lane Community Working Group are now available for download from the Document Depository over at the forum HERE. Of particular interest at the meeting was the latest schedule, from Barrat Homes, for completion of every aspect of Dalston Square: Definitely worth a look. And as I always say with links to that section of the forum (the hidden, DSRA specific section), if it will not let you in you need to read the post titled ‘Please Read this…….’ HERE. 1) The Residents’ Association – Who is it? What has it achieved? Where next? 2) Consort service charges, present and future – Value for money? 3) Planning applications for the Square – Issues of common concern. 4) Right to manage initiative (changing the management company) – Progress report. 5) Progress on our ‘good neighbourliness’ campaign – Improving the quality of life in and around the Square. Next up, an update on the public space of the Square itself. I am sure I am not alone in welcoming the opening of the next section of the Square this last Thursday. The hoarded section in the middle of the newly opened area is an electricity sub station that will be moved in the new year and so that will soon disappear. The area of grass is also temporary: This is what will become the children’s play area, but it extends slightly beyond the new hoarding line into Barrat’s site hut area and so has been turfed as a temporary measure. When Barrat open up the last section of the Square next spring, the grass will be removed and the play area constructed. Also coming in the spring is the water feature. Comprised of 9 synchronised water jets the feature is already in place (you can see the 9 metal discs, the jets, embedded in the paving) but will not be turned on until after the winter weather is behind us. Barrat’s latest estimate for completion of the public space is June 2013. Just one last thing to say….